Thermaltake Mod Submittal *NOW CLOSED to new Submittals"
I have finished the CAD models for my real submission. The aim is to meld the modded PC with high end car audio components. In both PC modding and custom car audio, the hardware is displayed in a way as to show-off, as much as it is made for performance/functionality. -Color is still kind of up in the air, depends who ends up major sponsoring the build. Would paint the accents as shown in models below. Would also get matching LED/cold cathode/etc lights for interior of case. -8&#34; Car audio subwoofer mounted in the normal PSU area, firing downward out of bottom of case. 1/2&#34; thick acrylic/perspex enclosure for matching sealed box frequency for optimum performance and show-off of components. Alternatively can also make it fire straight out of the bottom 200mm fan 'protrusion'. -2x 5.25&#34; Car audio component speakers mounted in upper 200mm fan area, also in 3/8&#34; thick acrylic/perspex enclosures for performance. -4-channel 500W 12v car audio amplifier mounted vertically in the position directly behind the drive bays. -Secondary ATX PSU dedicated for 12v power supply mounted in the lower 5.25&#34; drive bay area, turn-on wire spliced to primary computer PSU. May have to add a 12V audio cap here. -Possibly replace the 3.5&#34; drive bay section with a single DIN car audio headunit, relocate HDD tray lock. 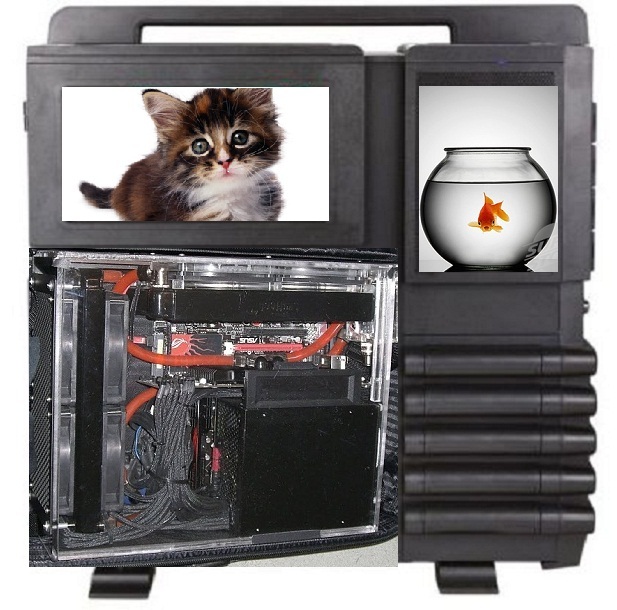 Are you going to at least leave a hole between the mobo/drive bay area so if you forget to feed the kitten it can at least eat the gold fish. OK finally updated with the real BeatBox submission! I've always been curious about putting car speakers in a PC but... what's the EMF range on a charged 8&#34; Car audio subwoofer? The 2x 5.25&#34; Car audio component speakers look like they're even closer to the processor.... Are you going to include any shielding? The on-board components (CPU, GPU) shouldn't have any problems with the EM noise. The only place you might get interference is if your SATA or PATA cables run near those magnets, due to the low frequency noise. PATA cables are generally unshielded, and SATA cables have thin foil shielding which is ineffective against the low frequency EM noise that would be generated off the subwoofer, for instance. If the cables ran near the subwoofer, it would require braided (stranded wires, looks like cable sleeving but metal) shielding to deal with the low frequency EM noise. In this case, the cables are as far away from the speakers/subwoofer as possible. Hmm.. I could also add a HDD holder near the subwoofer for a &#34;integrated HDD erasure&#34; feature! Anyway, I would go SSDs only in this case (I already have them anyway) mostly due to the insane vibrations the case would experience. Loc-tite and high density foam dampening material will likely be needed to applied liberally inside.. I'd use SSD too,but I thought anything with memory would be corruptible by magnetism. Well even DNA is &#34;corruptible&#34; by magnetism, but I'm not really worried about it. I'll do some long-run IntelBurnTest cycles with the speakers on to see if anything gets messed. Oh damn, and I realized that I suppressed the Thermaltake logo feature on my renders! Its actually embossed on the lower acrylic window replacement, but I suppressed it because it was taking a long time to render all the reflections and refractions from it. Anyway, yeah the Thermaltake logo will be either vinyl overlay or laser etched onto that bottom acrylic window. By Elmacho in forum Thermaltake Mod Submittal *NOW CLOSED to new Submittals"
By rodrosenberg in forum Thermaltake Mod Submittal *NOW CLOSED to new Submittals"
By Wizdumb in forum Thermaltake Mod Submittal *NOW CLOSED to new Submittals"